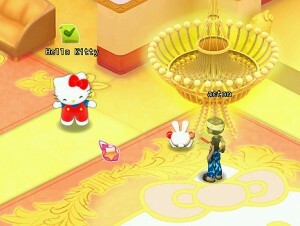 When I completed the Little Twin Star quest, I was told to see Mimi to help save Hello Kitty; at that time, I knew I was on the final arc. Before heading back from East Misty Land, you and I have unfinished business! When I first start the game and quest in East Mist Land, I ignorantly attacked an Araknos. I was KO sent home in a single blow. Well now, it is The Payback (break out the James Brown), I knocked him out three times. Revenge is a dish best served cold. Finally, all was need to cast the spell to restore the key, after putting up with Kiki’ humor, (it did not work more questing, oh just joking) I ran back to London and finally met Hello Kitty, the end of my long quest that started during Aeia Game’s open beta last year. Kitty White finally put all the pieces together, she revealed the purpose of the keys, and how a good idea went wrong. I received the final key; the wedding clothing has long been discontinued; a question I have for later was why were the weddingclothing offered in the first place. It seems out of place. 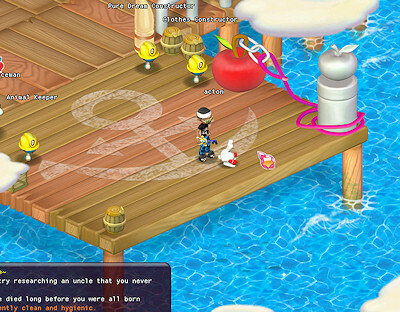 I felt the proper thing to do was to go back Sanrio Harbor where I sent taking to new friends and then to the dock where it al began almost a year ago. Hello Kitty’s words about future adventures nagged at me; I returned to Beijing to a visual riddle: A sign the points to a path, a path that leads to nowhere, and a new city far in the horizons being built. I enjoyed the game it was easy and still with the events held my interest. Because I took my time and did not grind through the quest, and item that were avaible for purchase were taken away and quest awards changed. The result was I was playing close to the released version where more emphasis on resource gathering and crafting than just grinding. 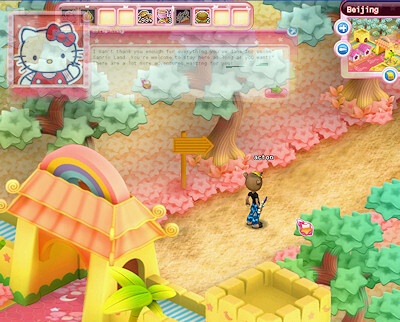 Ease of game play and of course it all Hello Kitty. I also like the special events. The way beta was handled, it should been clearer that many items in merchants were temporary; perhaps a smaller limited beta would help to prevent burnout. This entry was posted in Hello Kitty, MMORPG, Sanrio and tagged end of game, Hello Kitty on line by Actonrf. Bookmark the permalink.